PLANO, Texas, April 26, 2013 /PRNewswire/ — HailStrike, a national leader in storm tracking and reporting has developed 2 new products set to revolutionize the insurance industry. Aniswath, a patent pending algorithm that provides density, duration and direction of hail storms in a colorized fully animated map, allows users to follow the progression of a hail storm in real time and identify the locations with the most significant impact. OneSite, a totally unique report based on the data interpreted by the algorithm, includes all the storm activity affecting a specific site address over the past 2 years. Now insurance companies and adjusters can have access to all the relevant data for a specific address and no longer have to rely on vague information to evaluate and analyze potential storm damage. There is also a 10-year backlog of historical storm data for each location that provides users with a real time historical picture of storm activity for a particular date. (Houston, Texas) – Maxitile, a leading manufacturer of fiber cement roofing and siding products has joined forces with HailStrike (http://www.hailstrike.com) , a national leader in storm tracking and reporting to spearhead a national training seminar tour that educates contractors how to run their businesses more efficiently and effectively. The National Storm Damage Center, NSDC (http://stormdamagecenter.org), is a consumer advocacy group created to protect homeowners from unscrupulous roofing contractors and insurance scams. The NSDC, which conducts educational seminars nationwide, provides proper training and certification to help roofing contractors grow their businesses the right way. “Maxitile is excited regarding the opportunities our agreement with HailStrike brings our customers. This is a new innovative facet to our marketing efforts targeting the replacement roofing contractor,” says John Reagan, Maxitile’s National Sales Director. HailStrike, which provides instant and accurate graphical meteorological data that equips and empowers insurance companies, adjusters, roofing companies and various other service industries whose customers are impacted by severe weather, can recreate a hail storm with a fully colorized animated map that allows users to follow the progression of a storm in real time and identify the locations with the most significant impact. This enables insurance carriers and building contractors to focus exactly where the damage is located, following a severe weather event. Here at HailStrike, we are not content with “just good enough.” We are always striving to improve our products and services, guaranteeing a superior product for our clients. Our AniSwath maps – as you likely know by now – are interactive, animated hail maps that display hail storms, showing the path of the storm and precisely where hail landed. These maps were upgraded recently; generated faster so they are immediately available. Now, our outstanding development team has once again upgraded our AniSwath maps for superior tracking information. When ordering AniSwaths, customers are now informed of the best NEXRAD radar station or region based on an address they provide. This takes the guesswork out of the equation when trying to determine which station will provide the most information. Also, the path data presented will be filtered based on the time span of the selected AniSwath. This makes it easier to view storm paths for a specific time frame on a day with multiple hail events. HailStrike will continue to improve all products and services to give you the best possible information and tools. We will post any and all updates concerning our products. Now, try out our improved AniSwaths and get tracking! 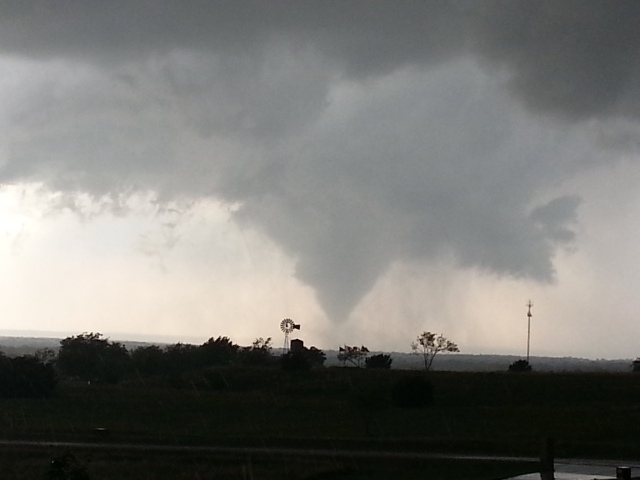 It seems that the severe weather from last week was only the beginning. A system of severe storms is moving through Texas, Oklahoma, and Kansas, bringing damaging winds, large hail, and potential tornadoes with it. Though the storms are potentially dangerous, they do not pose the same threat as those from last week. For more storm preparation tips, visit the NSDC site, follow their Twitter feed, and “like” their Facebook page. The severe storm systems that we experience this time of the year usually bring hail. In order to assess damages and track storm information, it is imperative that adjusters purchase our OneSites. This comprehensive report provides a detailed and accurate description of storm duration, speed, direction, scale, and hail size for a specific location. Roofers, adjusters, and trackers all need to use our AniSwaths. These animated maps show the duration of a hail storm, the intensity, the volume of hail, and the exact location in which hail has fallen. Using these maps is imperative for those who need to track hail or asses hail damage for specific areas. Hail stones larger that 0.5 inches can severely damage planes, causing immense damage within seconds. HailStrike is continuing to grow, becoming a dominant force for both the roofing and insurance industries. So, what makes us so important? The short answer: AniSwaths, OneSites, and Leads. The AniSwath is a patent pending algorithm that provides density, duration, and direction of hail storms on a colorized, animated map. This program allows users to track the progression of a storm in real time, which helps identify locations that received the most impact. AniSwaths are date and region specific, and are available for all locations around the nation. What is the Leads program? Any bad Leads will be replaced, free of charge. So what’s next for HailStrike? We will continue to provide the roofing and insurance industries with superior products and excellent customer service. Our development team will continue to push the envelop and generate products that will become an industry standard, and we will do everything in our power to make sure that our clients are satisfied, and more importantly, gaining more profit. Protecting Your Car From Hail: Is it Possible? Protecting your car from hailstones is tricky, particularly for residents in Texas – a state that reports more hail-related damages that any other state. The sad and unfortunate truth of the matter is car protection boils down to one simple principle: Putting the car in a garage or covered parking area is the only way to truly insure the protection of your vehicle. There are padded car covers available for purchase, but the product cannot withstand the force of impact from a hailstone. Covers cannot cushion the blows and are ultimately rendered useless. If you do not have a garage, or some form of covered parking (offered in apartment complexes), then your car is susceptible to the rigors of hail. When purchasing a policy for your car insurance, make sure you get comprehensive coverage. This form of coverage will cover the cost of damages from hail, floods, earthquakes, and other potential damages from natural disasters, not to mention reimbursement if the car is vandalized. Comprehensive coverage should be purchase regardless of whether or not the owner has shelter for the car (you never know when hail will fall while you are driving!). 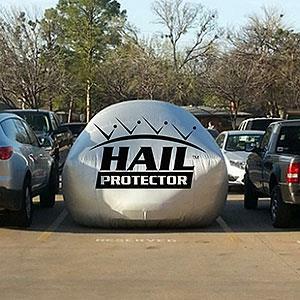 If all else fails, the “Hail Protector” is available for purchase. The “Hail Protector” is an airbag that wraps around the car. The air cushion provided from the “Protector” prevents hail from severely damaging the car. It runs off of a car battery – plug it in to the cigarette lighter – and costs about $299. Those who are tight on money or looking for more practical means of protection would be best served getting covered parking and comprehensive coverage. But do not forget, the best way to prevent hail damage is to stay current with weather reports and plan in advance if a hail warning is in effect.